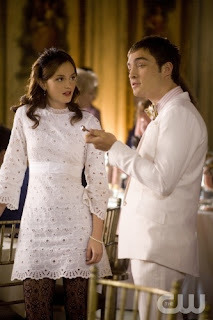 Blair Waldorf- At first I doubted you for your outlandish outfits, but now I'm starting to see the rhythm and ease with which you wear these attires. I'm starting to look forward to seeing what you've put together for your ensemble each week. I'm starting to think that perhaps I should purchase a headband with a big bow on it and wear black tights with dresses on a daily basis. Everyone was focused on Serena's big entrance, but what I'm starting to see now is that the focus has shifted. Looking forward to what you'll wear next week... xoxo!